Yesterday I drove the whole family up to Croome Court, the 18th century country estate of the sixth Earl of Coventry. Gardens and architectural creations by Lancelot ‘Capability’ Brown and interiors by Robert Adam. Beautiful place, and especially so if you were part of the English aristocracy in the 1760s when it was built. Then it was new, freshly appointed, decorated, and splendidly enjoyable. Those were its glorious days. Since then it has passed through several owners and the struggle is on to restore it fully and conserve it for future generations. That is why, more than 250 years later, the National Trust are valiantly doing a splendid job of caring for it with funding from English Heritage and National Lottery and other good souls who wish to preserve the beautiful things of the past for the education and upliftment of people in the future. I would like to say that I played my own, very small, part in preserving Croome Court some years ago. I and many others raised funds for its upkeep when, for a brief span of five years, it became known as ‘Chaitanya College at Croome Court’ and the headquarters of ISKCON in Britain. Now that period – 1979 to 1984 – is being remembered as the current guardians of Croome honour the small part in history that the devotees of Krishna played. It was a little disconcerting to find one’s youth consigned to a museum display board complete with ‘audio memories’ of former devotee residents. 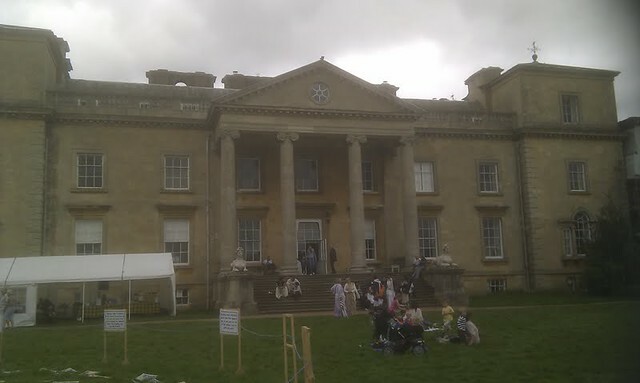 That too, amongst other similar displays portraying Croome life in the 1760s and 1800s! But I must be realistic and remember my age. 1979 is a long time ago if you’re a twenty-something National Trust volunteer born in the mid-80s! This is the second year that the National Trust and a committed team of Krishna devotees headed up by former residents Sripati and Tribhangananda have organised a ‘Hare Krishna Festival’ in the grounds. All the usual things we do for the public, but with around 900 visitors over the weekend. A great addition to our outreach and to a crowd that may not cross our path too often. But the slightly incongruous mix actually worked. We certainly felt at home there – back at home – and my kids were delighted to finally see the place they’d heard about. It was myself and my wife’s first visit there for 30 years. Walking history, we are.